It’s understandable, when stuck at a charging station, anxious to get home, and frustrated at the 3-4 hour (or more) recharge time for an electric car, and to scream at the heavens “why does it take so bloody long to recharge this car”? The reason has to do with the electrochemical reactions happening inside the battery pack, and it’s worth spending at least a little time gaining an understanding. While it might not decrease our time spent at the charging station, we’ll be a little wiser and able to better choose an electric car that fits our needs, and have an appreciation for the material science research promising future breakthroughs in rechargeable battery packs. It’s electrons which drive electric vehicles, and they are not liquids that can simply be poured from one jug to another like we do with gasoline. Electrons flow through wires and generally cannot be stored, except by chemically binding the electrons into a material. The closest anyone has gotten to the idea of pouring electrons into a bottle is the capacitor, and indeed ultracapacitors are sometimes floated as electric car energy storage units but they’re impractical due to expense and energy leakage. It might be easy to pour electrons into a capacitor, but almost impossible to keep them there once you’ve done so. Instead, rechargeable batteries use an reversible electrochemical reaction to store electrons in an electrolyte. There are many kinds of batteries, based on different chemical reactions and each with different performance characteristics in terms of energy stored per kilogram, energy stored per liter, safe discharge rate, safe recharge rate, lifetime, reliability, and so forth. 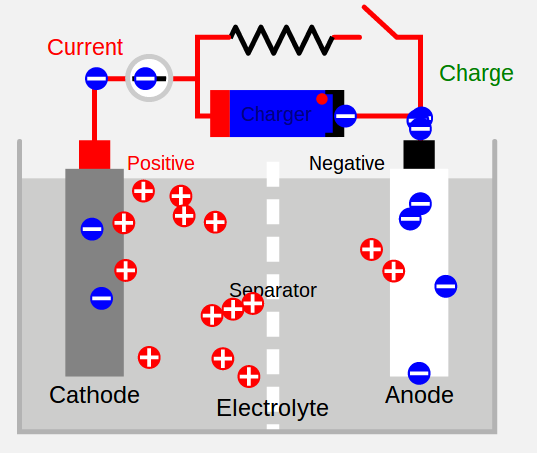 This simplified diagram shows how charging, and discharging, a battery pack works. To discharge a battery pack simply connect its cathode (positive terminal) and anode (negative terminal) to a “load”, or an electrical device. The device will draw power and, assuming the voltage level between the two is compatible, the device will perform its function, and while doing so an electro-chemical reaction occurs freeing electrons to flow from one side of the battery to the other. The electron flow depletes the “state of charge” which really means the electro-chemical balance loses electrical potential until it cannot supply any more electrons at which point the battery is fully discharged. To recharge the battery pack, simply connect a power source to the battery pack. Another electron flow occurs in which the chemical reactions reverses itself, and the electro-chemical balance regains electrical potential. The “power source” has to be a DC voltage source that’s compatible with the battery pack voltage. A battery pack will have a rated voltage (it’s “nominal voltage”). When fully charged the pack voltage will be much higher than the nominal voltage, and there is a maximum voltage beyond which the battery pack will be damaged (overcharged). A DC voltage source that’s “compatible” with the battery pack voltage is less than the maximum voltage. While charging the battery pack voltage rises making it possible to guesstimate whether the pack is fully charged from the voltage. The charging process must stop before the pack voltage exceeds the maximum voltage, or else the pack will be damaged. Battery pack capacity is measured in kiloWatt-hours. A kiloWatt-hour is 1 kiloWatt of energy for one hour, or 10 100-watt light bulbs burning for an hour. Remember that a kiloWatt is 1000 Watt’s, and that a Watt is 1 volt times 1 amp, so a kiloWatt is some combination of voltage that multiplies out to 1000 Watts (like, 100 volts at 10 amps). If the battery pack has a nominal voltage of 360 volts and a capacity of 24 kiloWatt-hours, the pack capacity is also rated for 66.66666 amp-hours. Recharging the pack means supplying it with enough kiloWatt-hours of electricity to raise the voltage high enough that you’re confident it is fully charged. That’s a DC voltage source – for example, 400 volts. The charging rate, expressed as kiloWatts, determines how quickly the pack will be recharged. To recharge 10 kiloWatt-hours at a 1 kiloWatt rate requires charging for about 10 hours. It’s more typical to charge at a 6 kiloWatt rate, which requires about 1.6666 hours, or 100 minutes. To charge at a 1 kiloWatt rate at 400 volts requires 2.5 amps. In other words, kiloWatts divided by voltage is amps. For a 400 volt pack, 10 hours of 2.5 amps (1 kiloWatt) means 25 amp-hours of electricity. To recharge 10 kiloWatt-hours in 5 minutes requires a 120 kiloWatt charging rate. However, not all battery chemistries can sustain this charging rate. Battery charging and discharging rates are often described a “C” rate of current. The C rate is a current which would theoretically fully charge or discharge the battery in one hour. For a 24 kiloWatt-hour pack, the C rate is 24 kiloWatts. With our example of recharging 10 kWh in 5 minutes, if it’s a 24 kWh pack a 120 kW charging rate is described as 5C. The 5C rate means the pack is completely discharged or recharged in 1/5th an hour. At the other end of the scale, a C/5 rate means it’s completely charged or discharged in 5 hours. For a 24 kWh pack, the C/5 rate is 4.8 kiloWatts. The C rate is important to understand because safe charge/discharge rates are often described in C terminology. Normal charging rate is often C/2 or slower, and many claim that fast charging above a 2C rate tends to cause battery pack damage. Batteries have internal resistance which causes heat proportional to the charging rate. The faster the charging rate, the hotter the battery pack gets, depending on how much internal resistance it has. Limiting heat during charging or discharging is important to protect against battery pack damage, and to lengthen its lifetime. The common way to limit heat is to limit the charging rate. Put another way, the electrochemical reactions cannot be rushed without risking damage to the pack. Because the safe charge rate is in C terminology, a bigger battery pack can sustain a higher charge rate than a small battery pack. The 120 kiloWatt charging rate we discussed earlier is a 5C rate for a 24 kiloWatt-hour pack but for an 85 kiloWatt-hour pack it’s only 1.4C. That means the Tesla Model S (85 kWh) can safely charge at 120 kiloWatts (1.4C) while the Nissan Leaf would risk battery pack damage at the 5C rate (120 kiloWatts into a 24 kWh pack). The maximum safe charging rate also varies for the battery chemistry. Some battery chemistries can safely charge at a higher rate than others.